Who Will Be Who in the FinTech World? Mobile banking and payments appear to be the main focus of the numerous (mainly small) FinTech companies that have raised funds – from a surprisingly diverse variety of backers – over the last three years. What is happening in the world of FinTech is one thing. What will happen is another. To gain a clearer insight into how the FinTech universe will appear in three years time, we are developing the Financial IT 2016/2017 Pathfinder Ranking, a definitive listing of the 50 most promising new startup companies. Nominations have come from Financial IT’s community of readers, FinTech providers and subscribers. Given the pace of change, we have only accepted nominations for startup companies that came into existence in 2013 or later. Our Expert Panel, consisting of industry veterans, venture capitalists (VCs) and Financial IT’s senior editors and research analysts, will draw up the Financial IT 2016/2017 Pathfinder Ranking on the basis of the information gathered. • Team, Background, etc. We will draw up a preliminary shortlist, and then engage with the companies on it before we produce the final Financial IT Pathfinder Ranking. For now, though, we have ranked the 70 companies nominated on the basis of the average score for four main criteria and the quantity of funds raised. 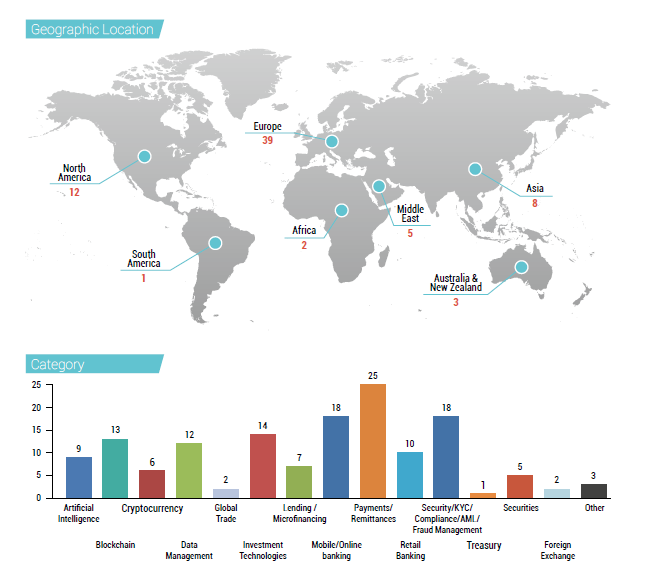 We have recognized 50 most promising fintech startups from the list and named them TOP 50. Those companies that didn’t receive the high scores and remained below the line were nominated as Rising Stars. Over time, we hope that the Financial IT 2016/2017 Pathfinder Ranking will be revised and extended, so that it is seen as a crucial work of reference for the industry. Even at this early stage in the process, a number of clear insights are evident. • Most of the nominated Pathfinders are relatively small companies, with only 10 of the 70 having raised more than US$10mn. Most have no more than a few dozen employees and associates. • Funding sources are varied. • Although the Pathfinders come from a variety of countries, a disproportionately large number are based in the United States or the UK. • It is not helpful to be categoric about the main area of interest of each of the Pathfinders. This is because there is often an overlap between the major elements of FinTech as Financial IT would see them. Blockchain often plays a key role in security/KYC solutions: Artificial Intelligence (AI) is often a key element of mobile banking solutions, and so on. • Nevertheless, about one-fifth of the Pathfinders have indicated that mobile banking and payments are their most important areas of focus. • About one-seventh of the Pathfinders have indicated that AI is their most important area. • Similar numbers are focusing primarily on each of block chain, data management/ core banking and investment/wealth management technology. • Smaller numbers of the Pathfinders are focusing mainly on (micro)-lending, KYC/ security, and other areas. 10 TOP50 Grow Financial Inc.